Litchi, one of the best known alternative software solutions to fly your DJI drones, offering before-flight waypoint management set up on your computer or laptop at home with the Litchi Mission Hub. Litchi is now our go to app for controlling and producing 360 panoramas in the air and on the ground. You create an account with a login using a username and password or via facebook. The Litchi Mission hub is designed for use on your PC or laptop only, it does not work with a mobile device. The Litchi Mission Hub works on both Windows and Apple computers. 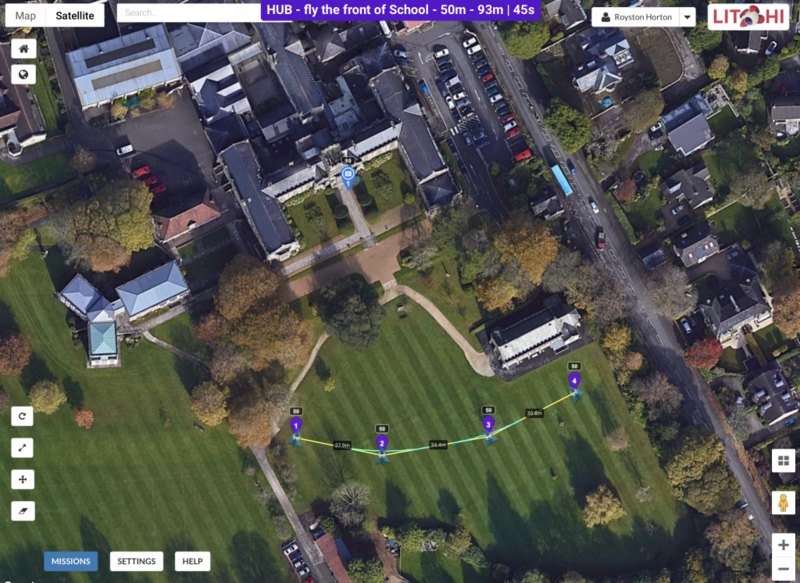 It uses the Google Maps engine and it is now possible to create a Litchi mission on the hub, which can consist of a number of waypoints, points of interest and then safety check the mission on Google Earth Pro by test flying the path before any drone flight. 3. Land - The drone will land directly below the last waypoint. 5. Reverse - the mission does not end, this setting allows you to perform the mission in reverse, by pulling back the right stick on the controller. 1. Straight lines - Where the drone will fly into the waypoint and can then perform a selection of actions at the waypoint - eg take a photo, start recording, perform a 360 panorama. 2. Curve Turns - The drone flies inside the way in a smooth consistent curve. The tightness of the curve can be adjusted. These two modes cannot be combined in one mission. A cruising speed can be set for the mission. We use a speed of 7km/per hour for rising shots and 15km/ per hour for flying forward or back over landscapes. A maximum flight speed can also be set for the mission and if you push the right stick forward on the controller the drones speed will increase from the cruising speed up to the maximum flight speed. When you let go of the right stick the drone speed will decrease back to the cruising speed. This determines the way your gimbal pitch will behave between waypoints. You can select one of three settings. 1. Disabled - You can control the camera pitch using the gimbal wheel on the controller. 2. Focus Point of Interest - The camera tracks a point of interest and the camera pitch. It will adjust automatically based on where it is in relation to the point of interest. (this is used in conjunction with Custom Heading Mode). 3. Interpolate - Can only be used when you have 2 waypoints in succession that have interpolate enabled. It allows you to define the pitch angle and the heading of the camera at each waypoint and Litchi will then smoothly interpolate any changes between the waypoints. You can set multiple waypoints and multiple Points of Interest in a single mission. 2. Above Ground - this is the height in relation to the true ground level in Google Maps. The above ground calculation only happens at the waypoint and not inbetween the waypoints. It is possible here to select your point of interest and any actions, if you have selected straight lines path mode. It is also possible to batch edit selected or all of the waypoints in one go, by holding down the control key on your keyboard and clicking on the waypoints you want to change. The batch edit can apply to Altitude, Speed, Curve Size, Point of interest and Gimbal Pitch. It does not apply to Heading. Read our post comparing the two apps.